After the cluster that was my Searching for Sunday reading experience, I craved a literary touchstone so spiritually challenging that I’d be knocked right off my high horse. I went straight to an old standby, C.S. Lewis. 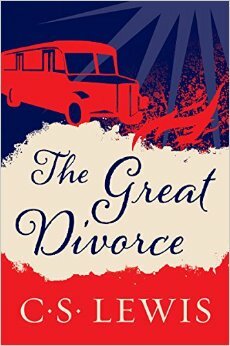 The Great Divorce has been on my shelf for more than a year, and after readjusting my expectations to encompass allegory, I dove into the narrative and tried very hard to picture the fantastical images of heaven and hell. Or rather, the Valley of the Shadow of Life and the Grey Town. It would take multiple posts to unpack all the imagery and symbolism in The Great Divorce, so I will effort here to present the broader message of the book. The story begins with the unnamed narrator waiting for a bus in the Grey Town, a dull place fraught with tension and general discontent. There is life in the Grey Town, but it’s a miserable one full of grumbling, inconvenience, and conflict. Aboard the bus the narrator learns from another passenger that the Grey Town is large and outspread, that it takes a lengthy amount of time to get one place or another. Everything about the place is tiresome. Once full, the bus seems to lift up and out, a curious floating, and lands on a cliff near a river with surrounding trees and grass. It is a place of unmatched beauty. Upon descending the bus, the narrator learns that despite its tranquil appearance nothing in this new land is soft. In fact, the grass is stiff and hard. To walk on it causes him pain. He also sees that the passengers on the bus, himself included, are not solid bodies as they once presumed. They are ghosts. Immediately they are approached by a second group of beings, called Spirits, though they have solid bodies, not ghostly ones. The narrator then understands that he is in the afterlife. What unfolds is a collection of interactions the narrator witnesses, combined with conversations with his own personal Spirit and teacher, the deceased 19th Century writer and preacher George MacDonald. The ghost-Spirit interactions include a painter whose pride prevents him from seeing God’s hand in creation, a grumbling woman whose life-long nagging and self-importance ruined her husband’s life (and her own), a bitter man who believed the whole of religion was a scam, a man who battled lust (characterized by a lizard who lingered on his shoulder), a shame-filled woman who still acts on the premise that everyone can be seduced, and so on. Each of these ghosts, minus the one who wrestles with lust, engages in a failed conversion. They all reject what the Spirits offer – a new home in the Valley of the Shadow of Life, which leads to life everlasting in the presence of God. Unable to shake their earthly sins, they return to the bus that will take them back to the Grey Town. If the ghost had chosen to rid him or herself of the sin that separated them from God, thereby moving to the Valley, then their time in the Grey Town was purgatory. If he or she refused the gift of life, then their residence in the Grey Town is eternal. Everything about the Shadow of the Valley of Life is freedom and, in turn, joy. To read that most of the ghosts ultimately rejected freedom and joy is heartbreaking, but the reality is that it happens in real life all the time. The bottom line is that C.S. Lewis crafts conversations between the ghosts and Spirits to reflect thoughts you and I have regularly. He captures our cynicism, our crutches, our pride, our jealousy. He paints a very real picture of what it means to be a flawed human and a seeker of truth. Our innate duality is in constant conflict, and ultimately we must decide which side will win. I believe there is a door open to meet Christ. If people who don’t know him in this world make it into the final kingdom of God, it’s because they met him through the final door. I’m open to the possibility.